Anybody had their delivery date moved FORWARD (Closer) than what was 1st predicted? I keep hoping that maybe they will move this forward a bit...maybe from some cancellations, or earlier production. Anybody? For Verizon customers, the phone will be available in stores on the 18th. Doesn't it seem like they would get it to those people who pre-ordered a day or two before that? Probably not. When P1 came out I went to my local Verizon store, they had a phone, but could not sell it until the release date. It was not in the computer. Probably not. When P1 came out I went to my local Verizon store, they had a phone, but could not sell it until the release date. It was no in the computer. And when I bought my P1, all they had in the stores when they were first released were 64GB models. To get a 128 you had to order online. Ordered 64 GB, Black Pixel 3 on Oct 10 Google Store unlocked. My cancel shipment option changed today. Not available anymore. Scheduled to be received by 22-23 Oct.
Well, they are quoting a "ship BY date" in the order update screen, so I do think it's a possibility. I've received pre-ordered devices a couple days early in the past. I keep checking my order page for updates. It's turning into a thing. You say Order Update screen. Where is that? When I view my orders, I just see 'Not yet shipped'. And yes..it shows "0." cost on one, that is because that one is financed through FI 0% offer. Mine ,through Verizon has 2 day shipping . So it's being shipped on the 16th I guess . They shipped one of my two Pixel3 XL's (the 64GB Black) early enough to arrive Friday. But for some reason Fedex Ground didn't get it on the truck like they said they had earlier. So now Monday, which is the date originally scheduled. No movement on my Nov 15-16 prediction for the one I really want... Black 128GB. sigh. I ordered from the google store, unlocked, on Sunday Oct 14, with a delivery date stated for Oct 24-25. It showed up on the 18th way before expected. Very Nice. but caught me without a case. Interestingly I am able to squeeze it into my Note4 wallet style case (it's really close to being the same size), while I'm waiting a couple days more to get a case. I'm careful with it that way cause its not a perfect fit and could pop out. Ordered a White XL 128 on the 15th. ETA said Nov 5th. It shipped on the 18th. Should be here Monday. Woo Hoo... Ordered OCt 10 thru FI .... They just notified me that the PixelXL 128 Black HAS moved up from Nov 15-16 to Nov 1-2. Hey Talon..... Are you joining the Pixel Club? 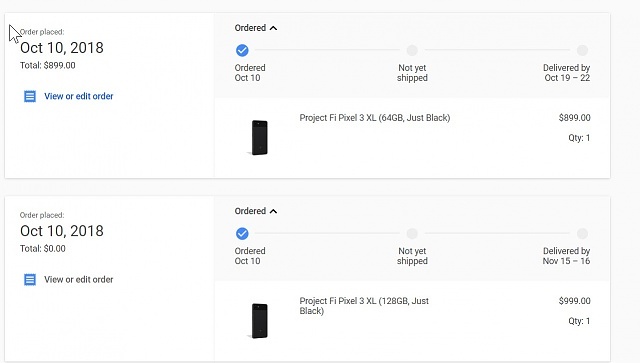 But My son's order for regular Pixel3 128 Black ordered Oct 11 thru FI, originally scheduled for October 29-30 just got move BACK to Nov30-Dec 3 That is a FULL MONTH delay. Not so good FI. They shipped his other phone a Pixel3 64GB version earlier and it has already arrived. But now for both he and I...we have the phone we will activate on the new line, in hand, but the 30 day clock will have to go at least 60 since BOTH phones have to be active for 30 days on the $799 credit. But my son's date has been jacked around AGAIN. Now today (about the day they would have had to ship to hit the Nov5 date)...moved back out to Dec 1. All this on Project FI-ordered device. Yes. I ordered as soon as possible so my sisgter would get it in time to bring it to me in Meixco. She and her husband were out of town on business the estimated deliver date was three days after they would return. The package was delivered three days before they were scheduled to return. It all worked out fine but I had one tense 24 hours. What is the latest security patch you are on?